Sometimes the allure of a hotel is in its story. 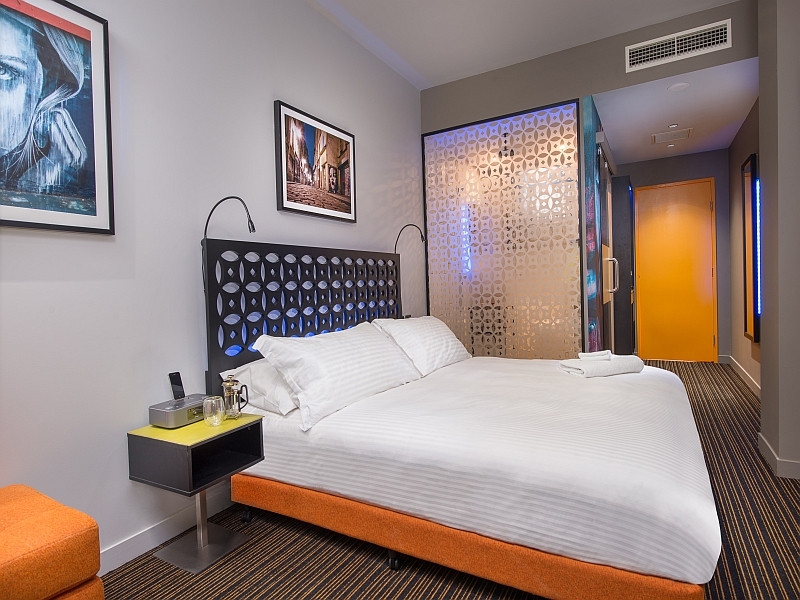 In the case of Tryp, the backstory and present-day cool factor work together to make it a top accommodation find in Brisbane’s trendy Fortitude Valley. In the 1950s the building housed the Royal Antediluvian Order of Buffaloes secret society. A door near the current reception area marked the entrance, which was only accessible to those in the know, and a plaque found during the renovation process recognises the founding members (this now hangs in the foyer). When the society moved out the building sat abandoned for almost a decade. During this period of neglect, the site became a magnet for four street artists, who adopted the crumbling walls as their canvas. Rone, Fintan Magee, Beastman and Numskull flanked the walls with their artistic creations and regularly erased their old works with new paintings – no doubt providing archaeologists of the future a storybook of layered images to unravel. When Gold Coast-based Shane Denman Architects swooped in to redevelop the site, it was apparent the street art would become a central facet of the new hotel. The original artists were invited back to stamp one of the four floors as their own, and now new murals and framed artworks adorn the walls of the rooms and corridors. The laneway running alongside the hotel preserves original murals, and electric blinds of the courtyard-facing rooms retract to reveal giant splashes of colour. King room with internal spa. Inside, the 65 rooms are equally vivid, with funky orange, lime and red furniture. It might sound garish, but it works. Rooms are a mix of queens and kings, and some of the king rooms include a courtyard, internal spa or external hot tub on an astro-turfed balcony. The casual Chur restaurant branches off the reception and has the appearance of an art-filled cafeteria, while the breezy rooftop bar UP can be accessed via the laneway. If you take a step back when you exit the hotel you’ll notice the brickwork flaunts another masterpiece – a three-story high portrait of former Miss Australia, Voni Delfos. Big or small, discovering the artwork woven into every aspect of the hotel is all part of the fun. Head to trypbrisbane.com to book.